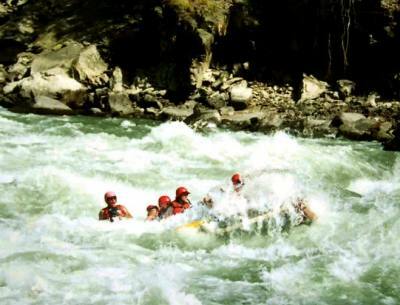 A most popular and scenic Trisuli River Rafting with amazing adventure paddling downstream encountering loads of waves with powerful and enjoyable rapids offers full of excitement and thrills with the combination of white-water rapids to bouncy waves includes scenic floats. 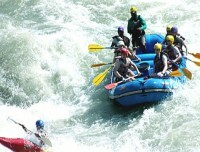 truly River Rafting an enjoyable river for a day or more with never a boring moment where our River captain will inform you on safety measures and paddling instruction, as the rivers grade changes every season from Grade I, II to IV depending upon its water level. Trisuli River with many tributaries rivers joining from Mt. Ganesh, Manaslu and Langtang as well from Mustang and Dhaulagiri Himal which later joins in to make Narayani River downstream around the low land of Terai, the flat land of Nepal with warmer sub-tropic temperatures. Trisuli a friendly and enjoyable river for rafting, an ideal for beginners, family as well for birdwatchers where you can spot many different species of bird life along the river and at its sandy shoreline, lined with thick lush verdant forest where some monkeys and other wildlife often spotted while rafting. 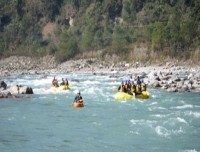 besides its superb scenery on float one can enjoy the rural farm village life while rafting or at the end of the rafting programs where you can spend overnight in the comfort of River Lodge / Resorts or camping on sandy beaches with time for walks along the local villages. 1 Arrive in Kathmandu via respective airlines and transfer to hotel. On arrival at Kathmandu international airport, you will be well received by Reasonable Treks & Tour staff and guide and then transfer you to your hotels within the hub of Kathmandu city around the most happening and exciting place around Thamel. The evening after checking into your rooms with refreshment our guides will brief regarding Tour of Kathmandu Heritage Sites with welcome dinner in a nice authentic Nepalese restaurant with culture show. 2 In Kathmandu sightseeing tour at places of interest duration 4-5 hrs.Morning starting our tour after breakfast with short drive and walk to Kathmandu Durbar Square (old Palace Courtyard), full of religious monuments with resident of famous Kumari Ghar (Living Goddess), visit Kal Bhairab, Red monkey god, ancient buildings of Malla rulers with magnificent architectures and intricate carvings from 7th to 16th Century. The Durbar Square full of colorful life with vendors of vegetables, curious, flutes, and other crafts with Kastamandap a rest house believed to have been built with the wood of a single tree and is the source from which the Kathmandu Valley got its name. Nearby are great drums which were beaten to announce royal decrees. All woodcarvings, statues, and architecture in this area are exceptionally fine, and Kathmandu Durbar Square is among the most important sights for travelers to witness, the complex also houses the Tribhuvan Museum that carries the mementos of different Shah Kings. Also referred to as the Blue Bhairab sometimes, it is a three-storeyed temple in the principal market called Indra Chowk. The divine image of the Akash Bhairab is displayed outside for a week-long period during the great festival of Indra Jatra. The celebration of Indra Jatra honors Indra- the King of Heaven and the God of Rain. This falls to be the historic seat of the past royalty, particularly belonging to the Malla dynasty. The Durbar Square, which is itself the old Royal Palace Complex dedicated to the Malla monarchs, is today classified as a World Heritage Site. The age-old temples and palaces epitomize the religious and cultural lifestyle of the people. The interesting things to view include Taleju Temple built by late King Mahendra Malla in 1549 A.D., a gigantic stone figure exposing the fearful manifestation of the Black Bhairab which the Hindus regard as the God of Destruction, the tall stone pillar on the plinth-top of which sits late King Pratap Malla his four children at the four small corners, the colossal image of the White Bhairab the lattice of which is removed for a week during the Kumari Yatra festival, the nine-storeyed Basantapur Palace (literally meaning the spring season palace), the Great Bell and the Great Drums. The main golden-gate is guarded by the Monkey-God called Hanuman. He is the king of the Monkeys and faithful servant to Lord Ram Chandra-the Hero of the Epic “Ramayan.” Being guarded by a sole protector, the gate itself has come to be known as Hanuman Gate. With a commercial umbrella suspended above his head and wrapped in a scarlet cloak, he squats on a stone plinth to be respected by hundreds of Nepalese Hindus plus Indian Hindus. The temple and the holy quadrangle with a Buddhist stupa at the center form the residential quarters of the Chaste Virgin Living Goddess called KUMARI. The traditional building has profusely carved wooden balconies and window screens. The non-Buddhist ant the non-Hindu visitors may enter the courtyard called the ‘bahal’ but may not proceed beyond upstairs. The KUMARI acknowledges their greetings from the middle window of the balcony particularly saved for her alone and the snapshot is strictly prohibited. Located nearby the Temple of Kumari, this is a unique type of wooden temple also known as Maru Satal. It was built in 1596 A.D. by King Laxmi Narsingh Malla. They say the timber used for its relevant construction was sawed out of a single tree. It is also believed that the capital of Kathmandu derived its new name from this very ‘Kastha Mandap.’ Today it housed the Hindu God namely Gorakh-Nath. after an interesting time around old Durbar Square a short drive west of the valley to reach at Swayambhunath (Monkey Temple): The great Stupa of Swayambhunath believed to be more than 25 centuries old, stands as one of the world’s oldest Buddhist Chaityas and the landmark of Kathmandu and Nepal. The Great Stupa of Swayambhunath is the wonder and the glory that was Nepal. It listed as World Heritage Site, the nerve center of faithful worshipers for all devout and pilgrims with honor to Lord Adi Buddha. It is dedicated to the self – originating flame of God. The stupa, which forms the salient structure, is well composed of a solid hemisphere of terra – cotta with four-sided all-seeing eyes of Lord Buddha, keeping an eternal watch on the Valley distinguishing between vice and virtue. The whole hill is a mosaic of small Chaitya and pagoda temples possessing great five Mahayana (Lamaism) and one Hinyan (Therbadist). On the hind hill is located another important Buddhist shrine; it is called Manjushree, the Chinese Buddha ‘God of Knowledge and Wisdom’. The afternoon with time for lunch break, then a short drive towards the east of the city to reach Hindu Temple of Pashupatinath, a pagoda-style temple with gilded roofs richly carved silver doors dedicated to Lord Shiva, situated on the bank of holy Bagmati River. One of the most holy temples in entire Hindu world, Pashupatinath Temple is the nerve center of pilgrimage on the day of Shiva-Ratri anniversary of Lord Shiva. This small religious town also houses a great temple known as Debpatan, situated 5 kilometers east of the capital city. Only Hindus are permitted to enter the main courtyard of the temple. Foreign tourists can view the temple from the eastern side of the River. Stands as the largest Buddhist shrine within South East Asia, this ancient colossal chhorten / Stupa built in 6th Century A.D. by King Man Deb. It rests on a series of three terraces looking from bird’s eye view it takes the form and relevant shape of a lotus flower, which indeed remains a very holy object for all the devout world-wide Buddhists. The chhorten is surrounded by a circular market, which forms a part of Tibet town overlooking four-sided Buddha’s eyes give a vivid flash. The chhorten embraces the authentic philosophy of Mahayana the faith of which is known as Lamaism in Sikkim, Ladakh, Bhutan, and Tibet. Airport pickups and drops in a private vehicle . Farewell dinner in typical Nepali Restaurant with cultural dance show . All ground transportation on a comfortable private vehicle as per the itinerary . sightseeing tour in Kathmandu including taxes and entrance fees . All government and local taxes . This is my first Time Nepal we did total 4 Days visit in Nepal with Reasonable Treks & Tour Pvt. Ltd / Anil Dhungana provided our service he’s is Very Helpful And professional assistance in planning for Kathmandu And Trisuli Rafting he’s is Organization for 1 Days Trisuli Rafting we really happy for your Trip. We will back Next Time !! Reasonable Treks And Tour Pvt. Ltd We provide The Price per Person is fixed as stated below. we provide for group Discounts of 15% for the booking of 5 or more than 5 persons. If a group booking of more than 10 person people we Discount for 20% your Trip. Note Start Dates are your arrival date in Nepal and End dates are the returning date from Nepal.